Can You Use Salt for Acne? Though acne may not be caused by salt; however, intake of sodium may form an environment in your skin, which promotes breakouts of acne. The response of food is different in different people. In some people, sodium may increase the oil present on their face, thereby, increasing the production of acne. Many foods that contain excess salt may also contain high amount of oil. It’s quite possible that breakouts of acne that are attributed to salt and sodium are actually caused by another ingredient in the food. For instance, majority of the processed and fast foods have high salt content. Additionally, according to some dermatologists, intake of iodine may result in inflammation of acne. Iodine is a mineral that is added to table salt. Iodine has also been linked to severity of acne. It is also believed that iodine may result in excess skin oils on the face. Does salt cause acne? There appears no direct relation between salt and increased appearance of acne. However, food is processed in a different way by every individual. Hence, you may consider reducing your intake of sodium, particularly if it is very high. While acne may not be caused by salt, utilizing salt water to wash face is quite often promoted as a very effective and easy treatment option for breakout of acne. The saltwater used is a simple mixture of water and salt (sea salt). There has been little research conducted to know why acne symptoms are relieved by using salt water. According to one theory, build up of bacteria is reduced by salt. This theory can be true as salt is added very frequently to foods to kill bacteria and prevent spoiling of food. However, there exists not much evidence that supports this theory. One more benefit of using salt in acne is that it dries out the face. This can be beneficial for those individuals whose acne results due to excess facial oils. If you are using salt to treat acne, use sea salt and not table salt as the latter contains iodine. Iodine may cause excess facial oil. You can use salt to treat acne by using a sea salt scrub. By using salt scrubs you can exfoliate or remove the dead skin cells and make the new skin cells to shine through. This makes them a popular treatment. You can purchase a salt scrub at a store or make your own by using almond oil or massage oil, essential oils and sea salt. In some people acne may occur due to dead skin buildup, which can easily be removed by salt scrubs and allowing greater renewal of skin. Does salt cause acne? 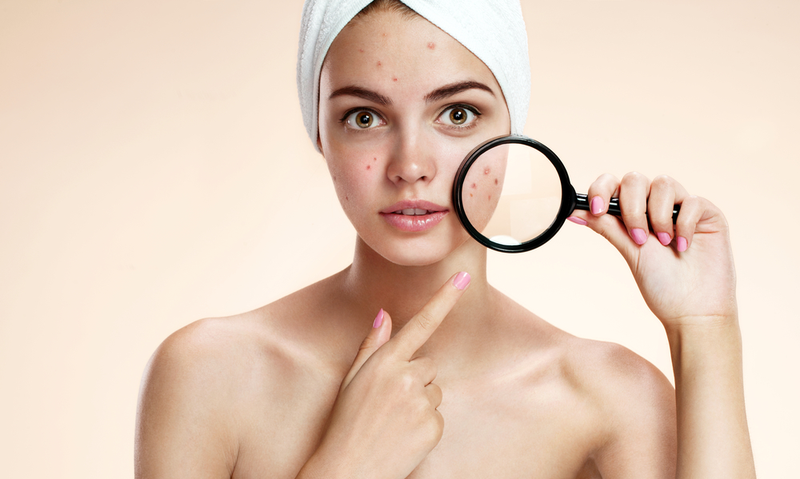 Acne is one of the common skin conditions, which affects millions of adults and teenagers. Some people believe that intake of salt may contribute to breakout of acne; however, no such link has been found. Salt is very effective natural treatment solution for acne. However, little research exists that proves the effectiveness of salt as an acne treatment. Since salt is relatively harmless and is easily available at the grocery stores, you can consider it as a worthwhile option to treat acne, but it should not be considered as the only option. According to a study conducted in year 2006, patients suffering from acne reported spices as one of the causes of their breakouts. Some experts are not on agreement on this fact and blame cosmetic products and poor hygiene for acne flare ups. However, it’s still better to reduce spicy foods from your diet. If you have less breakouts of acne, your self-esteem will be raised. According to several studies, consuming dairy products such as milk, cheese, ice cream and cream sauces increases the growth factors, insulin and other hormones releasing ability of your body. All these increased hormones can result in acne formation as they help the cells in the absorption of sugar. Apart from milk and cheese you have to also cut back on processed luncheon meats and granola bars as they also contain dairy products. Alcohol dehydrates your body, also your skin, causes wrinkling of your skin and prevents healing of your skin. It also does not allow the antioxidants including vitamins C and A to work properly especially hindering cell regeneration. Hence, you may find acne breakouts, wrinkles and blemishes on your face after drinking alcohol. However, resveratrol, which is an antioxidant, is present in red wine and it prevents aging of skin. You should stick to just 1 glass of red wine. Seafood particularly shellfish can cause clogging of your pores and result in acne. Shellfish including shrimp, crab and lobster have high content of iodine that can cause irritation of your skin resulting in acne on your face. In case you have clogged or congested pores, then consuming too much shellfish may accelerate the occurrence of pimples. If you are fond of eating donuts, white bread, cookies and food products that have high GI, then you are more prone to get pimples on your face. According to several studies, such food increases your levels of blood sugar and insulin, thereby triggering hormonal effects that are unwanted. There is a boost in the production of androgen, a male hormone that produces acne and triggers increased production of cells and oil. The result is that you become prone to acne and clogging of pores. Furthermore, such foods also result in weight gain.